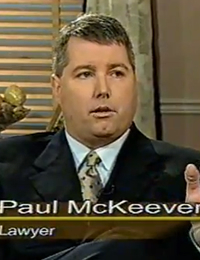 On October 31, 2000, Paul McKeever (Freedom Party of Ontario) was a guest of Rhonda London Live. In this episode, McKeever discussed with host Rhonda London Canada’s DNA databank and a twice convicted arsonist who is challenging in court a court order for the seizure of his blood, against his will, for DNA analysis purposes. Also guests on this episode: Scott Newark (lawyer), Priscilla Devilliers (President CAVEAT – Canadians Against Violence Everywhere Advocating for its Termination). Featuring: Paul McKeever (Freedom Party of Ontario), Scott Newark (lawyer), and Priscilla Devilliers (President CAVEAT – Canadians Against Violence Everywhere Advocating for its Termination). Freedom Flyer (Issue #34: Fall, 2000) Robert Metz – Rhonda London LIVE: Is Censorship Necessary?